MALMO, Sweden (VIP NEWS) — Rock band The Hives have been ordered by a court in Sweden to repay 18.5 million Swedish kronor to fellow Swedes The Cardigans. The legal dispute involves Tambourine Studios, a recording studio in Malmo that managed the two groups' finances. 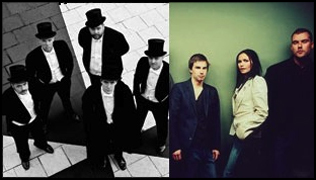 According to Radio Sweden, the studio routinely shuffled money between the bands' accounts for a number of years. The Hives claim they were never told that some of the money they were receiving was a form of loan. But a district court in Lund, southern Sweden, ruled the money still had to be paid, along with more than five million Swedish kronor (£500,000) in legal fees. "It is claimed that we borrowed money and simply do not want to pay it back," The Hives said prior to the judgement. The band insists there was "no agreement on the loan, no signed documents, no agreements on interest rates or terms of repayment". Their lawyer said they would appeal the verdict. Fronted by Pelle Almqvist, The Hives achieved mainstream success in the early 2000s with their punk-style rock, energetic live shows and coordinated black and white outfits. The Cardigans, fronted by Nina Persson, are best known for their 1997 hit Lovefool and the 1999 single release Erase/Rewind. The dispute is part of a long-running row involving many of Sweden's most successful bands, including Europe, rapper Timbuktu and The Soundtrack of Our Lives.